The Beachcombers’ Alert!™ newsletter is published by Dr. Curtis Ebbesmeyer and distributed via subscription. Distributed four times a year, Beachcombers’ Alert!™ features reports and articles concerning newly-discovered flotsam and other interesting beachcomber finds. 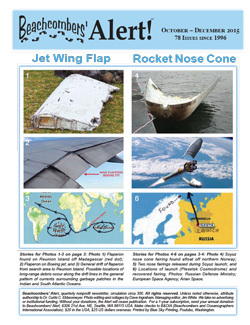 A sample issue can be downloaded here. For a 1-year subscription to Beachcombers’ Alert!™, join the Beachcombers’ and Oceanographers’ International Association by clicking the appropriate subscribe button at left or by mail. ($U.S. — make checks payable to B&OIA). More flotsam notes and conversation can be found at the Beachcombers’ Alert!™ Blog! Contributions welcome and encouraged—please send news clippings concerning drifitng objects! Catalog debris on your beach. Long-term observations are key to documenting ocean pollution. Contact Curt with your findings!